Ask fellow campers about "Chelan County Expo Center" and nearby attractions. This park is at the county fairgrounds and is built for rigs attending the county fair. In the non-fair seasons, it is open to the public. It is basically a large grassy (sort of) field with full hookups, the best wifi we have had in months, and easy access to lots of things to see and do. The camp host is very nice and accommodating. We are here during apple harvest so the air smells of fresh apples. There are orchards for all kinds of tree fruits everywhere you look. There is a choice of fresh fruit stands that we have taken advantage of. Honeycrisp apples and Hale peaches!! We ventured over to the cute Bavarian-themed Leavenworth, WA, about 20 minutes away, and stumbled on their annual Oktoberfest. Live music, vendors, and German sausages! Expected more breweries, however, being a Bavarian town. This area is known more for wines than beer. Lots of wineries within an easy driving radius. The park is actually in Cashmere, WA, about 8 miles from Wenatchee. 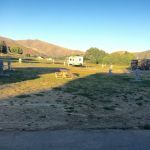 We camped at Chelan County Expo Center in a Travel Trailer. Don't miss Ohme Gardens and Apple Annie's Antiques. The gardens are amazing, but be warned, the paths, although totally paved with slabs of rock, are steep in some places. Use the free walking sticks at the entrance if you have any balance concerns. Apple Annie's is listed as one of the top 10 antique malls in America. Lots of "memories" in that building, mostly well displayed. Very little junk. Cashmere is also the home of Aplets and Cotlets, so take a factory tour. Booked a site online but park was pretty empty so host told us to pick any site and pull through. We have a fifth wheel, tow truck and extra vehicle and there was no extra charge. If the place is full it would be less tolerable as sites would be back to back and very close together. Check online to see if any events are going on. There is no shade, sites are sparse grass and dirt our site was fairly level. Full hook-ups were good, wifi worked well. No amenities here but convenient to Leavenworth, Cashmere, Wenatchee, Columbia River valley. We found it to be quiet and safe and the host was pleasant. We would stay here again but would check the events schedule first. We camped at Chelan County Expo Center in a Fifth Wheel. I visited during a music festival. For the first few days I was there, there weren't many people in the park, but by the weekend, it was packed to the gills. Before it got crowded, it wasn't a horrible place to stay, but it wasn't that nice either. The spaces are all on patchy grass/dirt, and are unlevel and bumpy. The utilities were all in good condition. The park is really just a big field, with no amenities. Once the park filled up, it was absolutely wretched, because of the way the sites were lined up. Two sites were back to back, and there were shared utilities in between every two sites, so the front yards were shared on every site. In most cases, only one of the two people thus situated could open their awning all the way. There was a great dearth of space for parking tow and towed vehicles, and they were just all over - it was a mess. On the bright side, the wifi was exceptional, and barely degraded at all when the park filled to capacity. I did not enjoy my stay, and would not return to this park. We camped at Chelan County Expo Center in a Motorhome. We decided to stay here to save a little $...and we didn't have many options. The KOA in Leavenworth wanted crazy money and some of the other nicer campgrounds were full. It's basically a big field, which we knew before we got there. No frills, but the best wifi of any park we've visited as we were able to stream Netflix. There are some full time residents that were a little messy. There is no shade and it was unusually hot (90+). I would stay here again but only as a last resort. We camped at Chelan County Expo Center in a Fifth Wheel. Nice grassy field with plenty of sites. When occupancy is low, these would be considered pull-throughs. Each site accommodates RV + 2 vehicles. Pets allowed. Bathroom/Showers and full-hookups. Across the street from Chelan County Expo Center/Fairgrounds. A dog fun area is provided to let your pups run, although we didn't look for it. Wi-Fi was good & strong. Clear view of sky for sat dishes. No shade - could be hot in summer. No picnic tables at sites. Quiet, and beautiful surroundings. Train tracks in the distance, but far enough away that it didn't disturb us. Can be a little windy here. 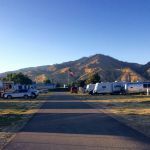 We camped at Chelan County Expo Center in a Travel Trailer. Look for the camp host at the west end of the campground, near the bathrooms. Side by side sites on dirt/grass. Beautiful area, surrounded by hills. Very quiet. Spotty wifi. Good power, excellent water pressure, no trees, good satellite reception. We camped at Chelan County Expo Center in a Motorhome. Lake Chelan, Leavenworth, Columbia River, Wentachee River, mountains and fruit (apples, peaches, pears, cherries) in season. Lots of wineries. This park doesn't look like much but we really enjoyed it because of the beautiful surroundings. It is absolutely gorgeous in this valley. We were camping with friends so we camped with our doors facing each other. Sites are very roomy. Not so happy with the host. Their site was positioned way in the back and if you don't know where they are you could spend a bit of time trying to find them. Also, their site was a pig pen. They really should be brought to task for it. And the trains, so often and so noisy! But it is so beautiful here! We would stay here again. We camped at Chelan County Expo Center in a Fifth Wheel. This is a typical fairground, very basic but functional. The interior roads and sites were on packed gravel and weedy grass. There were a number of potholes so you would need to drive slowly within the park. The electrical pedestal had 20/30/50 amp service. The utilities are used by two sites. The utilities for one of the two sites were on the wrong site. Therefore you would have to run your electrical cord, sewer and water hoses underneath the rig. All sites were back-in and “back to back”. The bathrooms were old and very dated. They were clean but not very appealing. Verizon air card and cell phone worked well here. There is a discount for staying 3 or more nights. There was a camp host on site. This was a good location to explore Cashmere and Wenatchee. We would consider come back again. We camped at Chelan County Expo Center in a Fifth Wheel. Very quiet campground, no train or road noise. Park Management was very friendly and helpful with local information. Not much in the way of amenities, but then again, we were only looking for a place with basic hookups. We plan on coming back and hopefully with a group next time. We camped at Chelan County Expo Center in a Truck Camper. Large grass field with long pull-throughs. Good location to visit Levenworth. Lots to do in the area. We camped at Chelan County Expo Center in a Fifth Wheel. Last minute trip over to Wenatchee, I needed a place for a Friday night during the summer. I called around and nothing available, but was told to call the fairgrounds. Nothing special about the place, big open grass field with full hook ups. I let the water run for a few minutes as it was rusty, but cleared up in seconds. I would come back if in a pinch. We camped at Chelan County Expo Center in a Motorhome. We stayed here in October and there was only one other RV in the campground. This is a basic county expo park with full hook-ups and 50 amps. We did not see anyone when we got here to pay our fee to so we left a note at the nearest office door that we would be back in a few hours after visiting in Leavenworth 12 miles away. We stopped at another office door and someone did come out and said to just come in tomorrow morning and pay. They could update a info sign to help you know where to go. It was a nice quiet place to spend the night. Satellite TV worked well and so did Verizon internet. 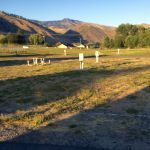 We camped at Chelan County Expo Center in a Motorhome. 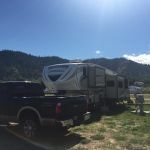 Here is a wide open, easily entered RV park at the fairgrounds featuring full hookups, level spaces and the beauty of the eastern Cascades to explore all around. There is no on-site registration; go to the exposition office around the corner during business hours. No amenities (other than during the county fair) but the community and surrounding area is worth a visit. This is the home of the Aplets and Cotlets factory; a tour is available. Leavenworth is just a few miles up the road; the RV spaces there are double the price. This was quiet and peaceful when we were here. In fact, there was only one other RV in the entire park! We camped at Chelan County Expo Center in a Fifth Wheel. Stayed at the Expo site at a rally. Good full hook up but street access in to the Expo site can be a little confusing. Good Verizon and fairly good park wi-fi. Quiet area. We camped at Chelan County Expo Center in a Motorhome. Are you affiliated with Chelan County Expo Center ?